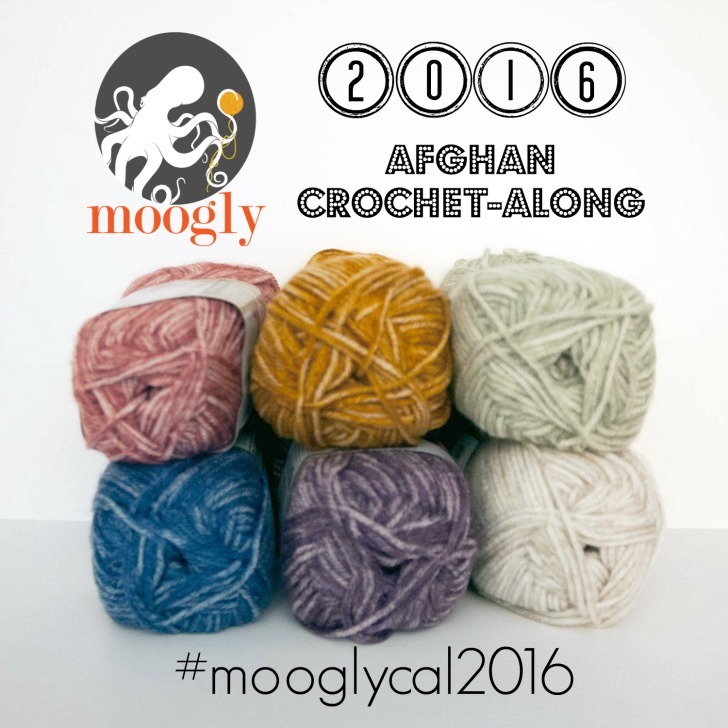 Announcing the 2016 Moogly Afghan Crochet-Along! 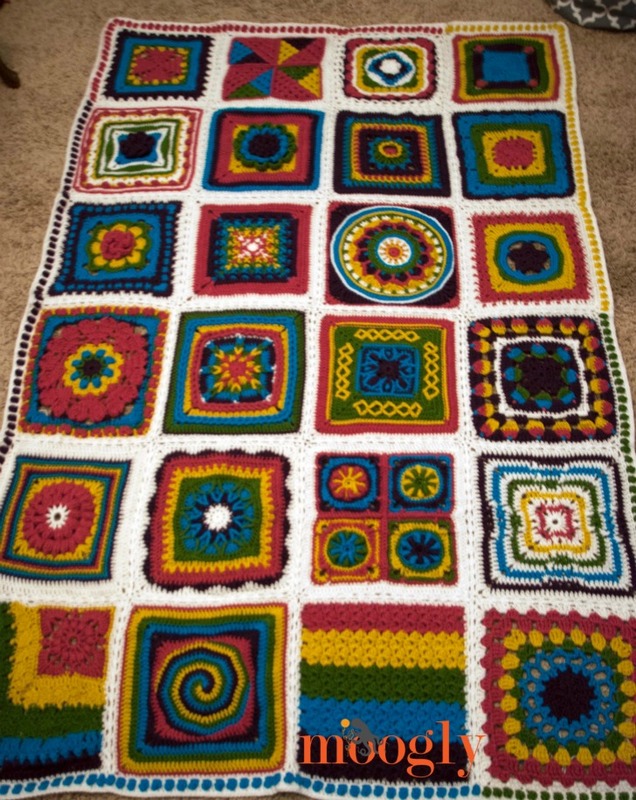 The Moogly Afghan Crochet-Along for 2015 was another huge success, and I think it was a big improvement over 2014 as well. 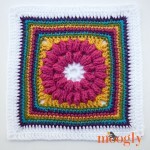 So I’m super excited to get to announce the 2016 Moogly Afghan Crochet-Along – back and better than ever! But first I have to share my finished blanket for 2015! 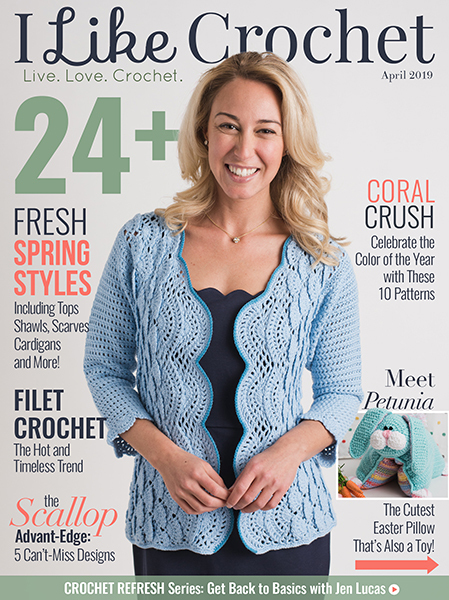 A big thank you to all the wonderful designers who contributed fantastic patterns – all free! You can get links to all the squares HERE. If you’re still finishing up the 2015 CAL, don’t worry – my posts aren’t going anywhere. And the designers have promised to keep them free forever! 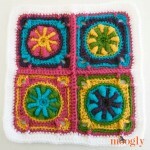 To join my squares, I used the Tight Braid Join, and for the edging I used the Polka Dot Border. I made the last round of the border white, and changed the color of the “dots” every 4 squares – and I love the way it turned out! I wish I could’ve gotten a better photo, but the recent winter storms took away all my pretty sunshine! So let’s get to 2016! Once again we’ll be using worsted/aran weight yarn, and a US – I, 5.5mm hook. And this year 24 designers have been handpicked by yours truly. 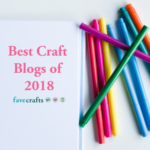 The patterns will all be FREE and available on their blogs – and they’ve agreed to put the pattern on Ravelry if for some reason their blog goes down. 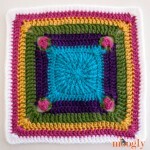 They’ve been asked to use 2 or more colors and create 12″ squares – but beyond that, it’s up to them! I can’t wait to see what they put together! 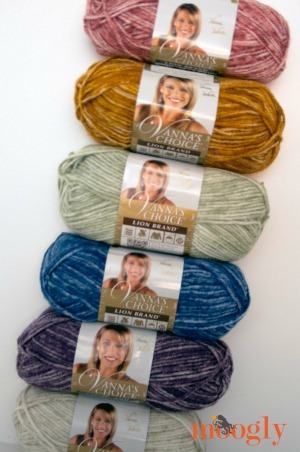 I will be using Lion Brand Vanna’s Choice – and I have my yarn all picked out! I decided to go with a softer color palette this year, and shown below are my choices: Rose Mist, Tangerine Mist, Seaspray Mist, Denim Mist, Purple Mist, and Pearl Mist. I got 4 skeins of the first 5 colors, and 6 skeins of the Pearl Mist, as that’s what I plan to use for joining and bordering. Based on the previous two year’s CALs, this should be plenty. With Vanna’s Choice dye lot isn’t usually an issue, as they do a great job keeping it consistent, but if you cannot purchase all your skeins at once, I’d definitely recommend picking a non dye lot yarn, or one where the dye lots don’t seem to matter. However, if you’re using multiple colors and mixing up the order of the blocks while joining, the dye lot really won’t matter at all – all things to consider! If you enjoy Ravelry and need help, the Ravelry CAL group will continue in 2016! Look for details HERE. The moderators are volunteers, and work very hard to keep things running smoothly, so please give them some thanks – they’re a HUGE help! I’ve also started a Pinterest board to track blocks with! So, I hope you’ll join us in 2016! The first block for the 2015 CAL will be shared here on Moogly on January 7th, and a new block will be shared every 2 weeks after than, ending right before Thanksgiving – and giving you the month of December to get it all put together! 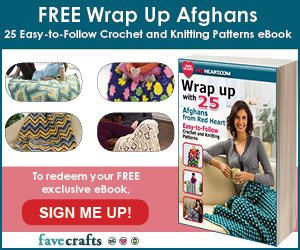 The 2015 Moogly Afghan CAL: Block #24! YAY!! Yesterday I was considering doing 2015’s blanket. But I MUCH prefer starting this year’s. 😀 I’ve gotten a sneak peek at a couple of the squares and I’m so excited! I would love to join.how do I go about that? I will be finishes with the one I’m in now in November. I WOULD LOVE TO JOIN YOUR 2016 CAL !!! Is there an approx total amount of yarn required? 😀 Hopefully this is the CAL that helps you cross that barrier! I know my first CAL that I participated in when I was learning taught me a lot! For the past few days, when I click on the “read More” button in your daily email, I get the 404 message. When I found a way to the post on your website and tried to leave a comment, I got it again. Finally found a way to post a comment–and the page is frozen– It’s not a usual thing to have such problem with your post and site. Hope ti soon gets resolved. I’m sorry you’re having trouble Ruth, the daily email is via RSS feed and I don’t have any control over it. The weekly email that you can subscribe to at the top has all the correct links each week though. What is the finished size of your 2015 quilt pictured above? Thanks! I still need to finish 2015 due to running out of yarn but this year I much rather buy it all at once… Love doing it can’t wait to get it all together…. I wonder how this might work to use up left over pieces of yarn from my last year’s projects? Might be interesting and worth a try! I crochet lots, but never been in a CAL before. Could I please join? ? Your blanket is really beautiful. I don’t have finished mine. I’m very great of participing at the Moogly CAL 2016. I have never joined a chrochet a long before. Hope this will be fun. I love to crochet. Thank you for this tempting activity. 🙂 Welcome, and thank you! 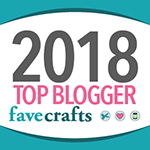 Hi Patricia – if you haven’t already done so, you might want to join the Ravelry group that Tamara mentioned in her post. All the patterns will be accessible right there in the group. There are links to the previous Moogly CALs from 2014 and 2015 so you can see how the groups are set up and where the patterns are as well. I’m considering your new CAL – my first ever! I heard about it from your e-newsletter. Will the patterns be posted there or do I have to go to Ravelry? Thanks… I’m excited! They will all be linked here. 🙂 I hope you enjoy them! Thank you! It’s fun picking out a new color scheme every year! This is my 3rd year and I’ve enjoyed and learned so much!! Some of the patterns in the first year were deliciously challenging… the second year there weren’t as many of those patterns with new stitches or challenging instructions. I was such a beginner the first year and I realize there are lots of beginners this year too; have a few challenging patterns really helped me to grow my skills. I’m hoping this year, we have a handful of designs that teach us new stitches or techniques that give us a good challenge – for me, that makes the CAL even more fun. 🙂 I don’t want beginners to be intimidated or discouraged, but I hope you’ll encourage the designers to not hold back with some of their patterns. I’m hoping for a good variety as well! 🙂 Thank you Heidi! You mentioned your yarn is in skeins. How many grams per skein or yards or metres. Yeah! Year number 3 for me to participate in your CAL. Can’t wait to get started, have colors picked out, but need to buy the yarn. This year will have similar color scheme; seems both daughters wanted blues ? Got my yarn and ready to go. My first time to be involved in a year long project….exciting! Firstly thank you for doing this again. Even though I have not finished last year’s I am really looking forward to this year’s challenge. Well that’s my resolution broken (- no more yarn until I’d cleared the stash a bit!) Although I have just started a project that’ll clear 2000m so surly that almost counts a cleared? Lots of lovely yarn ordered for this afghan CAL, this time a present to me and my bedroom. Can’t wait to get started, thank you! Already joined another CAL group, but I will be actively watching this cal-never know what to do with variegateds. I got halfway through the 2014 CAL and didn’t finish. Then school & two jobs interfered with the 2015 CAL. It is going to be one of my New Years resolutions to finish the 2016 CAL. I love the satisfaction that a completed project gives. I’m looking forward to this one!!! 😀 I’m glad to hear it! And if you join them all together your blanket will be HUGE! I was kinda bummed that, although I followed along with the CAL 2015, I ended up not participating. I admit, I became a little intimidated. Since I’ve been crocheting for about 2 years now, I’ve had a little bit of a difficult time reading crochet instructions. I found the videos were my best option for learning the different stitches. So the designs for the 2015 CAL were a little challenging for me to read; but i got it! In Nov, I decided to give it a try, and did the first 3 squares. The third square ended up being much bigger than the first 2; not sure where i went wrong there. But they turned out really pretty! This year, I’m really hoping that I can truly CAL, instead of just following. I have an idea for the colors that I would like to use; which are the skeins that are mixed colors. But those are a bit smaller than the normal single colored skeins. I’ve been sticking with the Red Heart brand. Its easy to work with, fairly inexpensive, and sturdy! Thank you so much for everything you and the team do! 😀 Thank you, I hope so too! 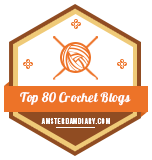 It’s a good way to learn – if you get stuck on a pattern, the Ravelry group is a HUGE help! 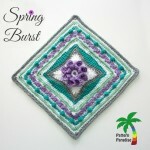 Looking forward to participating in this crochet along. I am making this for my friend of 40 years that celebrated New Year’s with me and informed me that I have never made anything for her. I made my first Moogly pattern last year when I made the Leaping Crochet sweaters for my twin grandsons. This will be fun! I’ve tried everyday for a week to sign up for emails for CAL but I can’t get it to work! Help! ? Looking forward to this. Any idea how much yarn will be needed for this first square? I enjoyed your 2015 CAL. Thank you for all your hard work in putting it together. I finished all the squares. They are blocked. I still need to join them. I’m left handed and am having a hard time finding a joining technique to use. It seems the single crochet is the way I will go. I really want to use a prettier join, like the five chain braid, but I can’t find a left handed video to follow. Anyway, I’m starting 2016 square today! So excited to work along with everyone! Hi I was looking for something new and fun for 2016 and I think I have found it!! Just a question : You are talking of 4 skeins per colour, does that mean the same as 4 x 100g of yarn per colour? Hi Amelia! You click the “Join This Group” button on the Ravelry page. 🙂 Thank you! You mentioned that your square came out smaller so you added more rounds. Mine also came out at about 10 inches (I am using Red Heart Soft). I have not done a CAL before so I am confused about altering the size. I always put blankets together with the same size and pattern squares. If I add rows to alter dimensions to 12 inches what will happen with the other squares from your other designers….will they “line up” properly when I need to put them together or should I just leave the square as completed and have a smaller afghan…sorry – sort of confused. Don’t want to alter patterns by adding rows and not have the squares go together properly. Thank you so much Niko! I am hoping to do a few minis, yes! 😀 Still working out the details. I just ran across your wonderful site and am in love with the CAL. I will joining along with all of you. As I was looking through 2015 to get an idea of how it works and the finished work, I didn’t instructions on how you join the squares together. But seem to remember someone in one of the comments mention something about using a “pearl stitch”, which I’ve not heard of before. So I searched all over for that stitch and nothing is coming up. Could you clarify for me or give me the link to finishing the quilt in case I overlooked it? This is such a wonderful I idea and I’m excited to participate this year!!! Thank you so much Teresa! 😀 There are lots of ways to put them all together, and each person gets to pick there own. I used the tight braid join, but people used all sorts of joins! I have a collection of other joins here, but I’m afraid the Pearl Stitch is a new one to me too! I came across your site yesterday…and love your CAL. The results are just fantabulous! I went out and purchased my yarn this evening and will be joining in. Got a little catching up to do…but, I’m up for the challenge. Thanks for your time and dedication. 😀 Thank you so much Melody! I’m so glad it inspired you to join! I am joining my very first CAL with this project. I have decided to use only stash which doesn’t include lots of worsted weight, however but I’m getting along fine. Different yarns add for an interesting effect, but perhaps complicated for washing. I am also testing for hook size, with different yarns. Also enjoying learning new stiches. Block number one is so pretty and block #2 is nice as well. Thanks for the explanations in French. 😀 Yay, welcome! I’m so glad you’re enjoying it! 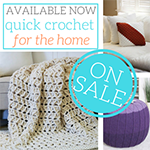 I am hang so much fun doing this crochet along! I had never heard of CAL before so this is fun! I love all the different patterns. so the fact that if I mess up I have time to figure out what I did wrong and correct it!. I just might go back and look at the previous CALs and try them as well! Thanks for you great patterns and ideas! Thank you so much Lisa!! ♥ I really appreciate you saying so, and I’m so glad you’re enjoying it!! Hello, I’m french and love crocheting and knitting and the wool. I would like to begin my first CAL this year but I can’t manage to reach the 4th and 5th square in french. I’ve only the first, second and third one. Please could you help me and give the way to catch the pattern in french. I’m a fan of all your patterns. Hello Catherine! I believe our translator is a little behind – hopefully the French editions will be added very soon! I am looking for the you are My sunshine blanket. It’s the blanket that has the words on it. THE Words are spelled out you are my sunshine.